Above: High part accuracies on Ermak press brake technology (upper right) and comparison study results convinced Container Services Group to invest in its first fiber laser (foreground): an Ermak Fibermak Momentum-Gen 3. May 2016 - When Container Service Group (CSG) needed to replace aging equipment, it initially sought to keep its shear and punch operations status quo. CSG Co-owner John Driscoll and his son, Operations Manager Mike Driscoll, attended a demonstration of a new turret punch at Ermak USA’s showroom in Elk Grove Village, Illinois. While there, Mac-Tech Regional Sales Manager Adam Quoss piqued their interest by showing the two an Ermak Fibermak Momentum-Gen 3 fiber laser machine and some sample parts. The Milwaukee, Wisconsin-based company is a metal fabrication equipment distributor and service provider for the Greater Midwest Region. “We had talked about this technology in the past but, frankly, we were skeptical of its fit at CSG,” says John Driscoll. The Fibermak fiber laser has helped Container Services Group reclaim lost production time, eliminate the hand labor previously required to produce and clean parts, and reallocate manpower to value-added assembly work. 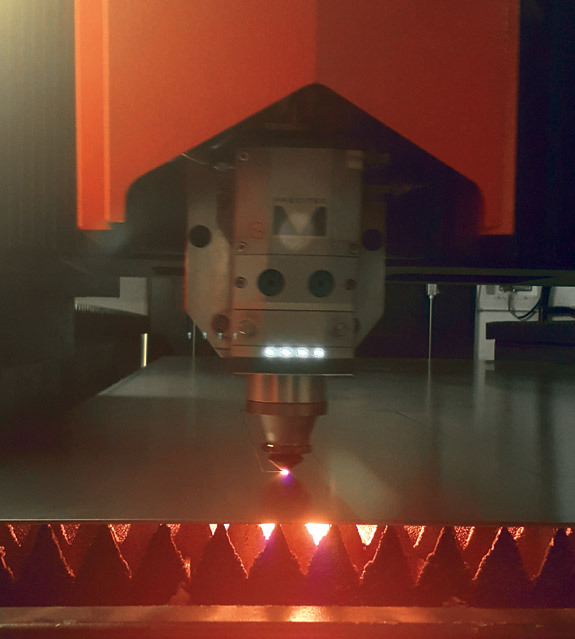 A comparison study of the Fibermak laser’s machine production capability, flexibility and capacity with that of a turret punch proved revealing. Customers’ evolving demands make flexibility crucial for Driscoll and Co-owner Steve Sowski, who founded CSG in 2002. The manufacturer serves the container handling industry, specializing in mechanical and air conveyor systems for beer, beverage and food cans. Engineering, fabrication and installation complement CSG’s production of mat top, tabletop, cable conveyors and gravity fittings as well as single-lane and mass air conveyors with single air filters. The partners gained their industry experience working at a local conveyor company and later for American National Can. “Production, spoilage and line speeds are some of our customers’ biggest challenges,” says Driscoll. The Fibermak produced this part in 20-gauge stainless steel grade 304, measuring 11 mm by 18 mm and with 100 square holes and 100 round holes, in 30 seconds. Repeat business makes up the bulk of CSG’s market share and service is its primary conduit. The Fibermak allows the manufacturer to easily shift between long and short runs depending on customer requirements. When parts production was run on the turret punch, sheet metal had to be sheared prior to punching. Because the fiber laser eliminates this step, material handling is reduced. Mac-Tech training made the transition from turret to laser easy for CSG’s machine operators, notes Driscoll. 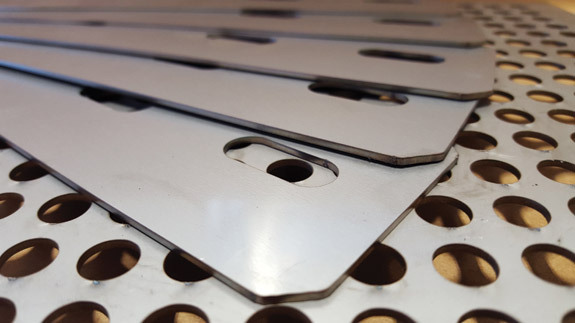 CSG uses the fiber laser to cut mild steel up to 3⁄4-in. thick. In some cases sheet metal can be cut at three times the speed of a CO2. Cutting tables are dual-pallet design ranging in size from 4 ft. by 8 ft. to 10 ft. by 26 ft.
A high-precision Precitec ProCutter cutting head and IPG resonator equips the machine to cut a wide range of materials up to 1 in. thick. The head is also lightweight for fast acceleration and cutting speeds. Its fully integrated sensor system monitors the cutting process and provides users like CSG with information that supports repeatability. Stainless steel grade 304, 11-gauge brackets and air-handling conveyors. Small components are nested for optimized assembly. The laser runs 65 to 70 hours a week, processing parts ranging in size from 1 in. by 1 in. up to 60 in. by 10 ft. Because parts are either bolted together for assemblies or welded for larger components, accuracy is essential. “The Fibermak comes with a rack-and-pinion servo drive, which allows it to work continuously under demanding conditions while maintaining a 0.001-in. positioning accuracy and a repetition accuracy of 0.0006 in.,” says Quoss.